I’m a dude’s dude, but I’m not afraid to admit there’s nothing more adorable than baby animals. It’s one thing to see a puppy in person, but it’s a whole other thing to see lion cubs in person. That doesn’t happen very often, but Tove and I just had the opportunity to see the new lion cubs at Woodland Park Zoo in Seattle. 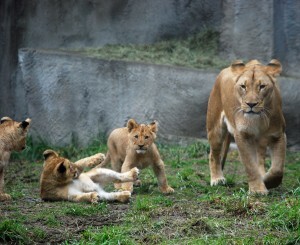 The lion cubs were born in Seattle on November 8, 2012, but they weren’t introduced to the public until February 2, 2013. That means there’s still plenty of excitement buzzing around these babies. There are four lion cubs in all — two boys and two girls. The lion cubs are still just learning their new environment right now, so they’re only in front of the public from 11am-2pm every day (depending on the weather). Otherwise, the pride is closed off in their private den. All of the excitement added with limited viewing opportunities means there is a long line to see the lion cubs at Woodland Park Zoo. Tove and I waited in the cold for 45 minutes to see them. It sounds like it could have been much worse. After I posted a picture of the lion cubs on my Facebook page, one of my friends told me that her wait was an hour and ten minutes. They don’t want to overwhelm the lion cubs, so the Woodland Park Zoo only allows in about 10-15 people at a time to see them. Once you’re into the viewing area, you only get about five minutes to look at the lion cubs before you’re asked to move on (to keep the line moving). 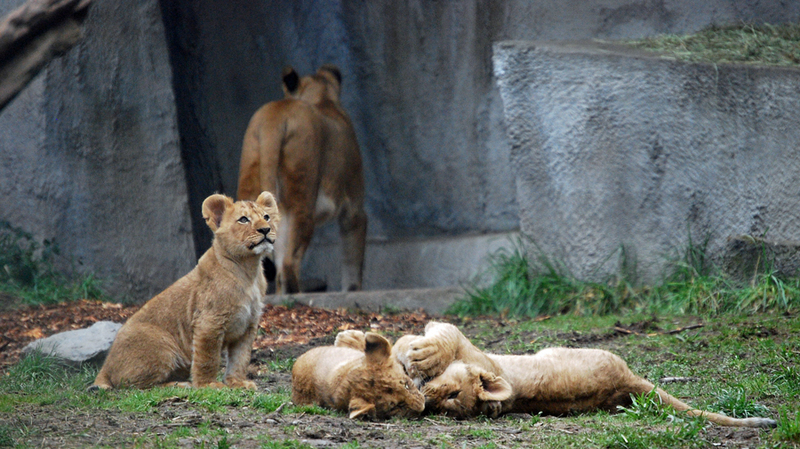 If you have the patience — or more importantly — if your kids have the patience, the wait is totally worth it to see the lion cubs at Woodland Park Zoo. They’re cute little buggers and they’re full of energy. 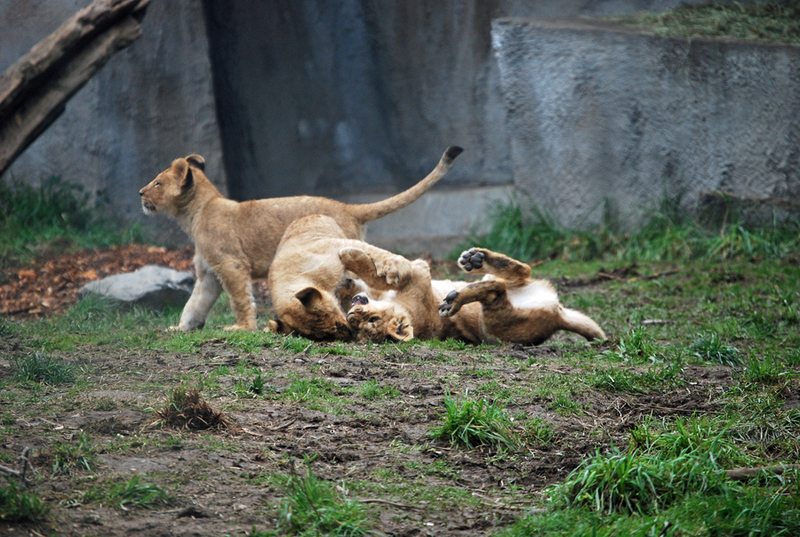 They pounce all over each other, and a zoo volunteer told us the lion cubs’ favorite play toy is their mom. 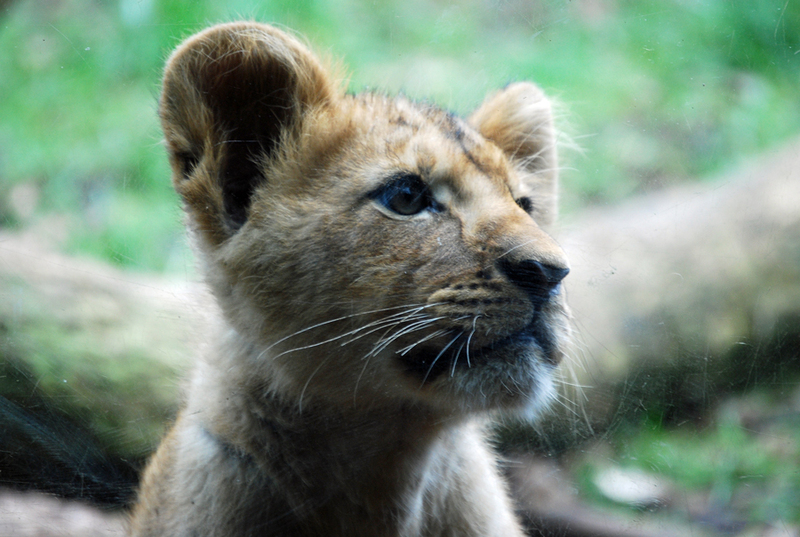 When Tove and I first walked in, one of the lion cubs was looking out of the glass right in front of us. The Woodland Park Zoo employee inside told us to take our pictures quickly, because they’re not usually that close. One of the volunteers even warned us that there are times you can’t actually see the lion cubs at all (even when they’re on view to the public), because the mom takes the babies to the back for feeding. So, just keep that in your back pocket if you’re planning a visit to the zoo. 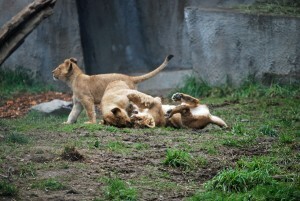 You still have plenty of time to see the lion cubs at Woodland Park Zoo. They’ll be in Seattle until they’re 18 months old. At that point, they’ll be sent somewhere else as part of a lion conservancy program. The sooner you get to the zoo the better though, because (stating the obvious) the lion cubs are getting bigger by the day. Let us know what you think of the little buggers by leaving a comment below or connecting with us on Facebook, Twitter and Google+. P.S. If you’re planning a trip to Woodland Park Zoo on your Seattle vacation, we highly suggest checking out the Seattle CityPASS. It gives you a discounted rate to six of the city’s top attractions, including the zoo.